Today, in a moment of rapid and radical changes, there is the risk of interpreting the emerging trends – which are decisive for the success of the Market and Governance strategies – with an obsolete mindset. ● Disruptive Innovation is not based on technology: rather, going “beyond technology”. from the one today defined as Industry 4.0. 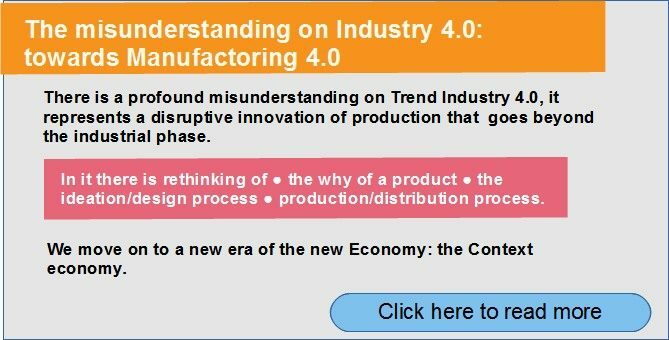 In the post ”Innovation in the new post-industrial Market – Manufactory 4.0″ <see> we illustrate how we should rather define the new trend with the term Manufacturing 4.0. In other words, Industry 4.0 is not an improvement of the Industry dimension, but a disruptive innovation of production that goes beyond the industrial phase. then that of industrial production systems. The new “machineries” (smart, based on the “Makers” methodology, and on desktop devices connected via internet) are extremely versatile and can quickly be adapted to new productions, simply by changing the software that manages them, and some accessories. And they can be used by unskilled personnel (they can be programmed by downloading files from the Web, and there may be remote support from experienced personnel). It is even possible to install temporary production workshops, taking advantage of the availability of “warehouses” no longer used by the traditional Industry (the machines can also be hired). In the new industrial revolution towards Manufacturing 4.0, we move on to a new era of the new Economy: the Context economy. It represents a mode of production and “consumption” that is completely different from the current one, in which the market no longer develops in terms of mass. In the Era Manufacturing 4.0 the products will be mostly “taylor made” (it goes beyond the customization): the Crowd enters the design and production phase (up to the Open Factories). An example of the new post-industrial era is the Model identified by INNOVA, that of the Franchising-Transplant Factories that represent a (remarkable) evolution of the Transplant Factories: factories of the size of workshops that produce under license with radically new methods .